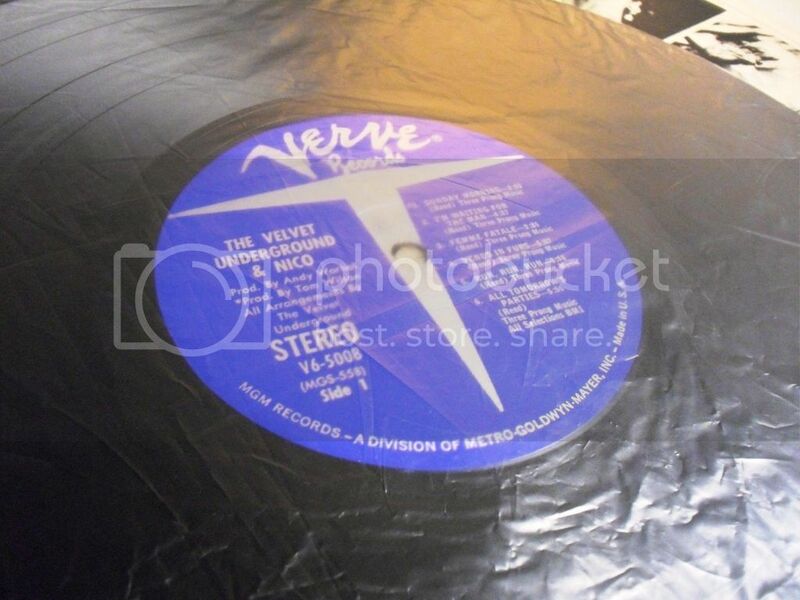 What does anyone make of this LP & its story on Ebay – not something I was aware existed. The image (which isn't brilliant) does seem to only show 5 songs instead of the 6 on Side A. It could simply be a misspress of course but its interesting, I wonder where it came from? The band had been active since 1964 as a part of Andy Warhol's "Exploding Plastic Inevitable". Coinciding with most United States albums of the time, the original album concept was to have 10 tracks in total, 5 on Side A and 5 on Side B. As you may know, the famous Sceptor Studio recordings by the band in April 1966 consisted of only 10 songs. These are the tracks found on this release - a pressing made prior the to addition of "Sunday Morning". Although these 10 tracks are present, they are of a different mix to the commercial release. Played back to back with a regular copy there are subtle differences in the levels of instruments for some tracks. This pressing was also produced by Andy Warhol exclusively, whereas the commercial release was not just his input. The label on the record incorrectly credits Tom Wilson with "Sunday Morning" and it's production, but the track does not actually appear. "Heroin, Venus In Furs, I'm Waiting For The Man and European Son" were re-recorded in LA by Tom Wilson. The mix may be slightly different on this release, but the recordings are those used on the commercial release. The "G" in "MGS" is crossed out on Side 1 to denote that the track listing for Side 1 was to be amended. This album was bought from a deceased estate in the U.S.A. in 2014 and I have not seen another. The estate included other rarities such as the yellow label promo copy of "Nico - Chelsea Girl". The purchase of this item will include a signed statement from a well-known and respected record store owner from Queensland, Australia, providing authentication to this piece. there are six tracks on the label and the first one is deffo Sunday Morning - perhaps the track isn't on the actual vinyl? I asked the seller - "The one thing that is puzzling me is why would it have (later) labels ie saying that Sunday Morning is on the record, if the initial plan was to issue the LP without SM track?" He replied - "I agree with you in relation to the label. All I can put it down to is that they only bothered to make the one label and one album cover, (the cover also has Sunday Morning on it, identical to the commercial release). After all, at no point did the record label give the go-ahead for Lou Reed's differing opinion. He may have been able to get one through the pressing machine before they realised their mistake and changed it. The G in MGS on the matrix is crossed out to denote a pressing mistake." Really interesting find Bleach, thanks for sharing. There are clearer photos on eBay and Sunday Morning is definitely missing. You can tell by the space each track takes up that the rest of the track list is correct. His story makes sense to me, we do know SM wasn't originally going to be on the album so it seems logical there would be a pressing, or possibly test pressing, that didn't include it. Maybe it was originally a white label and the labels and cover were added later? The only thing that puzzles me is why he calls it Lou Reeds cut? There's no specific mention of Lou being involved in this particular disc in his description, is he implying this was just a pressing Lou had done for himself to give the album a listen on vinyl? Would make a great candidate for the 50th Anniversary release of the VU&N! I was v skeptical about this, but it appears to be legit. There are other instances in the 60s where the wrong takes or mixes made it onto the first pressings of higher profile LPs (eg Revolver and Highway 61 Revisited), but I don't remember any where a track was just missed off. The other weird thing is how there are evidently so few copies out there that it would take nearly 50 yrs for one to surface. It appears to be an east coast pressing. The tale the seller is telling about it being Lou's pressing is total BS imo - like the fact that it's a mega rare pressing isn't enough. Price is a fantasy obviously - the usual tactic of putting on ebay just to get it known and then taking the highest offer off site. What sprung to mnd when I first saw this one was the pre-release VU&N that David Bowie famously acquired via Ken Pitt in late '66, which was also missing Sunday Morning. Bowie's copy had no labels - just a handwritten 'Warhol' sticker - but my hunch is that the runouts would match this one. Bowie's copy can be seen at the David Bowie Is exhibition and certanly looks pressed, rather than the acetate it's often ascribed as, so this could possibly be confirmed by an eagle-eyed attendee? I'm not sure about the crossed-out 'G' either, but the 'Rev' in the Side A runouts of all 'standard' copies does imply an earlier version existed..
(Per Richie Unterberger, Ken Pitt's visit to the Factory was November 10th 1966). anagrama wrote: (Per Richie Unterberger, Ken Pitt's visit to the Factory was November 10th 1966). Unterberger also states Bowie's copy was an acetate and did feature Sunday Morning, however. simonm wrote: The tale the seller is telling about it being Lou's pressing is total BS imo - like the fact that it's a mega rare pressing isn't enough. Price is a fantasy obviously - the usual tactic of putting on ebay just to get it known and then taking the highest offer off site. There is no way to authenticate this as Lou's copy. I would imagine if it actually was Lou's, then he would have included the provenance in the auction description. It could be that the estate that sold it said it was Lou's...but c'mon. The dude wants the same price as the Scepter Acetate brought in the first time it went up for auction. Who on earth would spend that kind of money on a goddamn mispress! It's very possible that this was a mispress from the original run, but I don't think it's any more mysterious than that. I'd be surprised if someone would pay any more for this than they would for a correctly pressed copy from another early run. Probably less. You'll see I made a joke about the price...and then he implies this is more valuable than the Scepter Acetate. His answer is more of a joke than mine!